On St Valentine’s Day, it is my pleasure to show you love tokens found in the River Thames from the collection gathered over the last seventeen years by my mudlark friend Steve Brooker, widely known as Mud God. The magical potential of throwing a coin into the water has been recognised by different cultures in different times with all kinds of meanings. Yet since we can never ask those who threw these tokens why they did it, we can only surmise that engraving your beloved’s name upon a coin and throwing it into the water was a gesture to attract good fortune. It was a wish. With a great river like the Thames racing down towards the ocean, there is a sense of a connection to the infinite. And there is a sweet romance to the notion of a lover secretly throwing a token into the water, feeling that the strength of their emotions connects them to a force larger than themselves. In the reign of William III, it was the fashion for a young man to give a crooked coin to the object of his affections. The coin was bent both to become an amulet and to prevent it being reused. 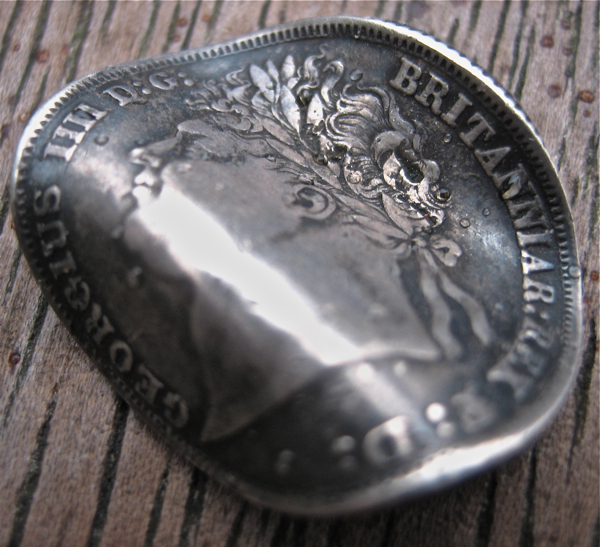 If the token was kept, it indicated that the affection was reciprocated, but if the coin was discarded then it was a rejection – which casts a different light upon these coins in the river. Are they, each one, evidence of unrequited affections? 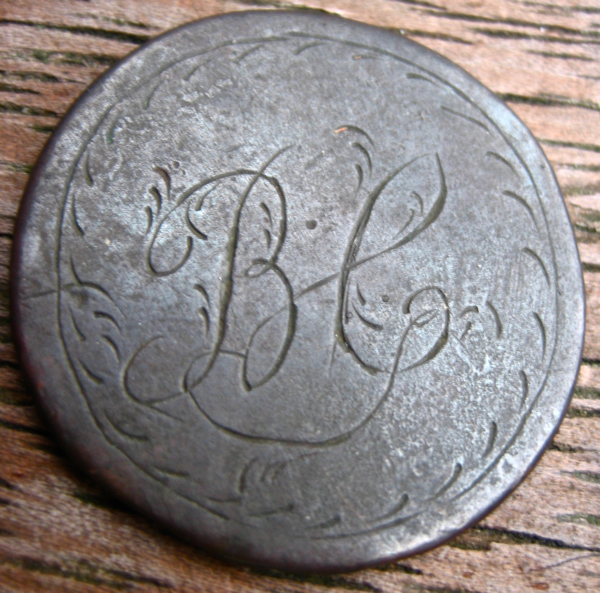 From the end of the eighteenth century and until the early twentieth century, smoothed coins were used as love tokens, with the initials of the sender engraved or embossed upon the surface. Sometimes these were pierced, which gave recipient the option to wear it around the neck. In Steve’s collection, the tokens range from heavy silver coins with initials professionally engraved to pennies worn smooth through hours of labour and engraved in stilted painstaking letters. In many examples shown here, the amount of effort expended in working these coins, smoothing, engraving or cutting them is truly extraordinary, which speaks of the longing of the makers. Steve has found many thousands of coins in the bed of the Thames over the years but it is these worked examples that mean most to him because he recognises the dignity of the human emotion that each one manifests. Those who threw them into the river did not know that Steve was going to be there one day to catch them yet, whatever the outcome of these romances, he ensures that the tokens are kept safe. 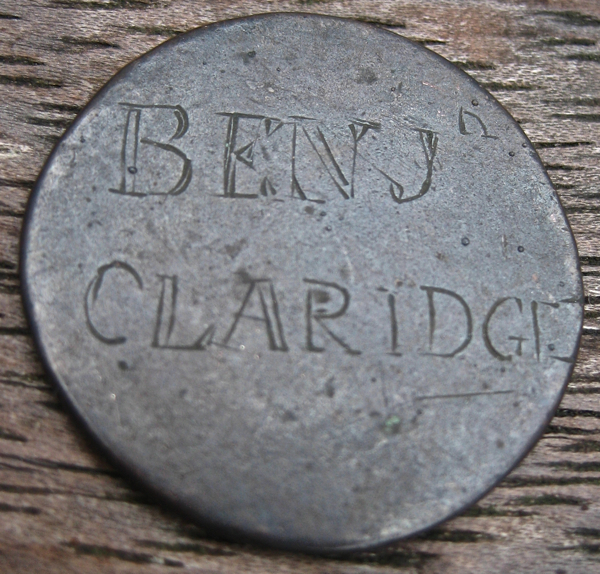 The reverse of the Benjamin Claridge coin, from the eighteenth century or earlier. 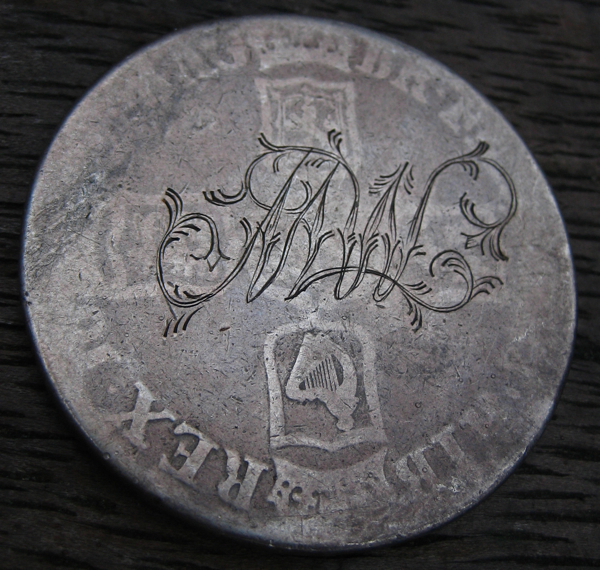 The intials M and W intertwined upon a Georgian silver coin. 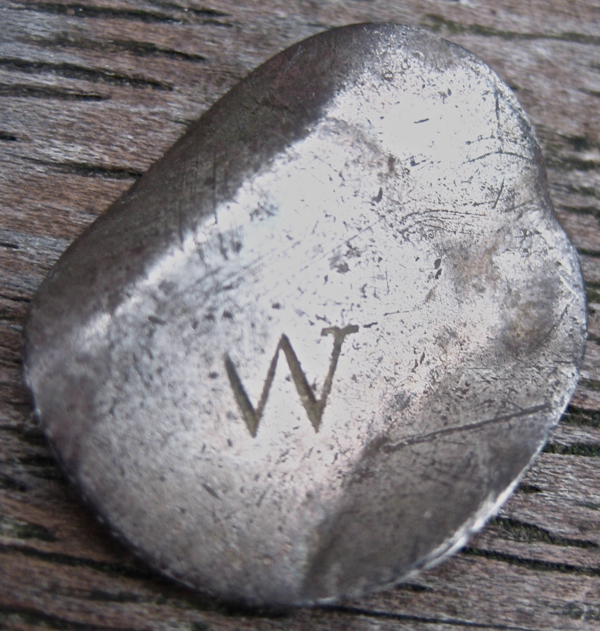 The intial W upon the smoothed face of Georgian silver coin, bent into an S shape. Crooked Georgian silver coin, as the token of a vow or promise. 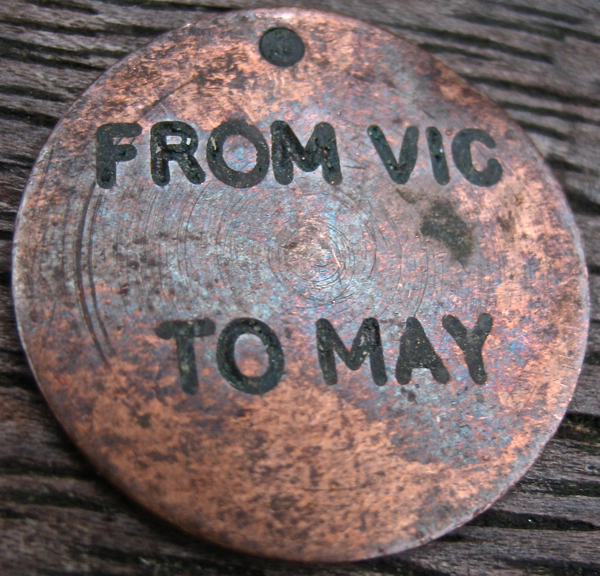 The initials AMD upon a smoothed coins that has been pierced to wear around the neck. 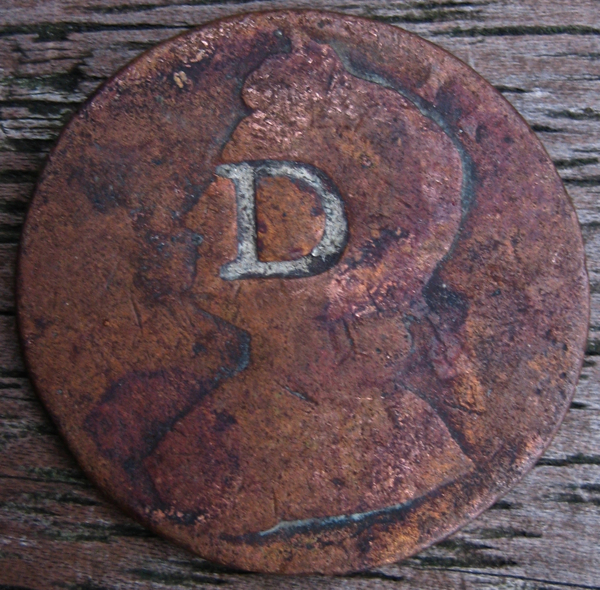 A copper penny with the letter D.
C.M. 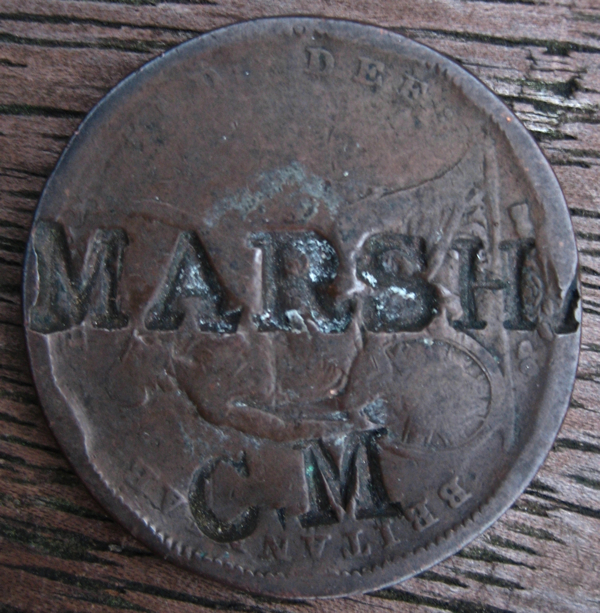 Marsh impressed into a penny. 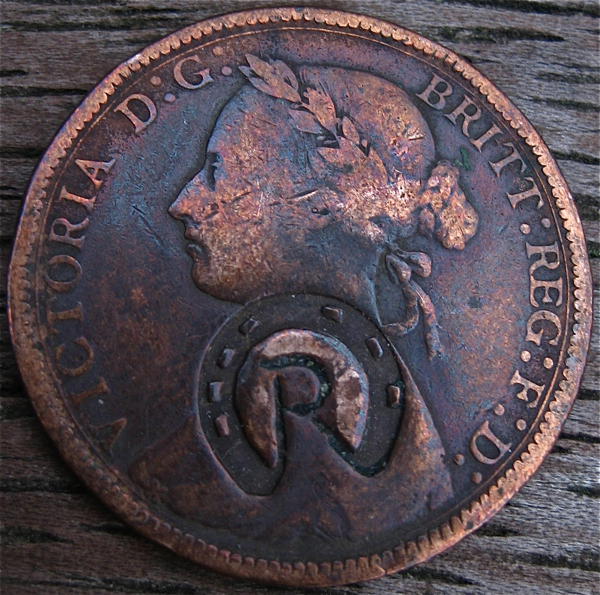 The letter R punched into a penny within a lucky horseshoe. 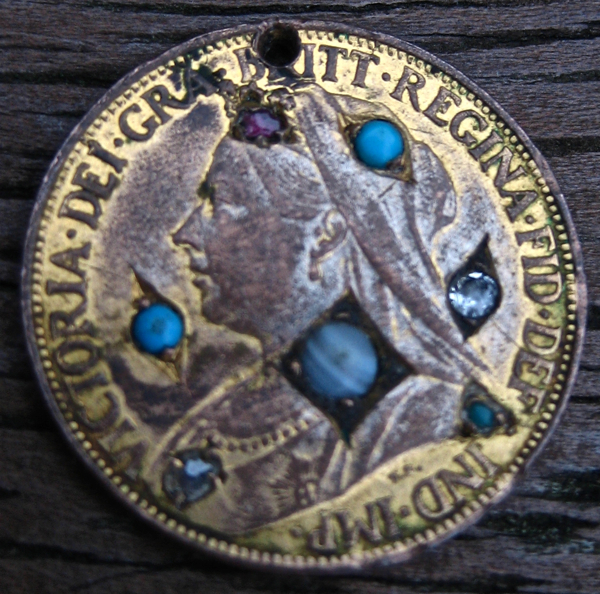 Pierced coin set with semi-precious stones. 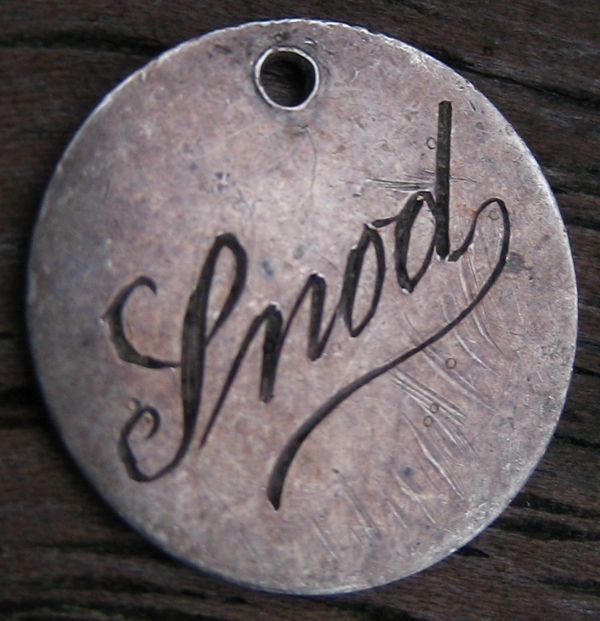 Who was Snod? 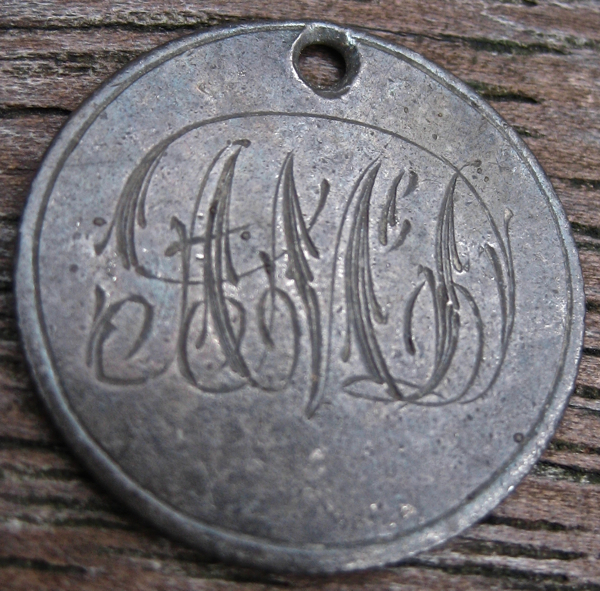 Is this a lover’s token or a dog tag? 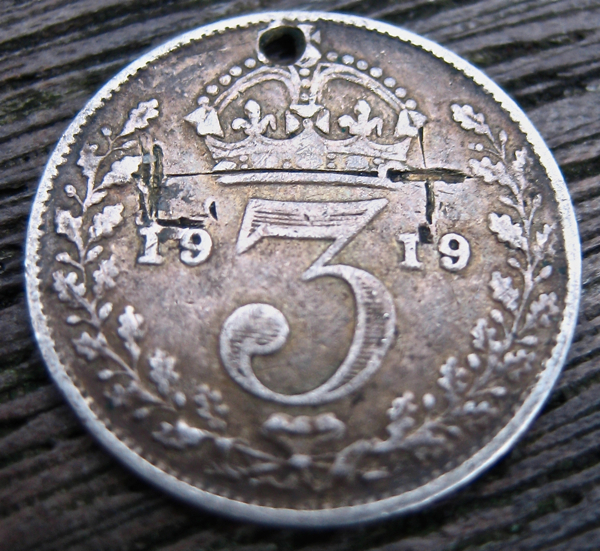 This pierced silver threepence commemorates the date January 11th 1921. 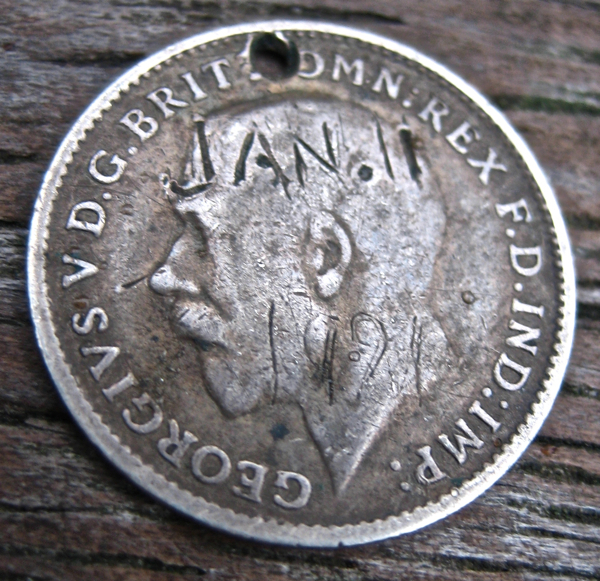 On the reverse of the silver threepence are the initials, L T. Are these the initials of the giver, or does it signify “Love Token”? 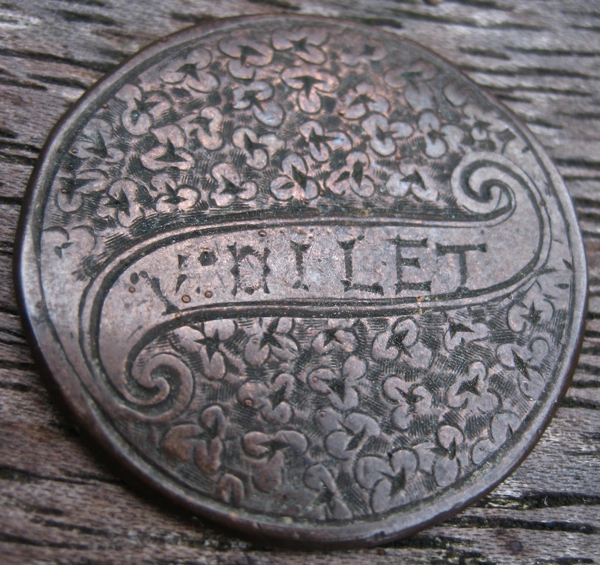 A smoothed penny with the name Voilet upon it. A phonetic spelling of the name “Violet”as the beloved spoke it? 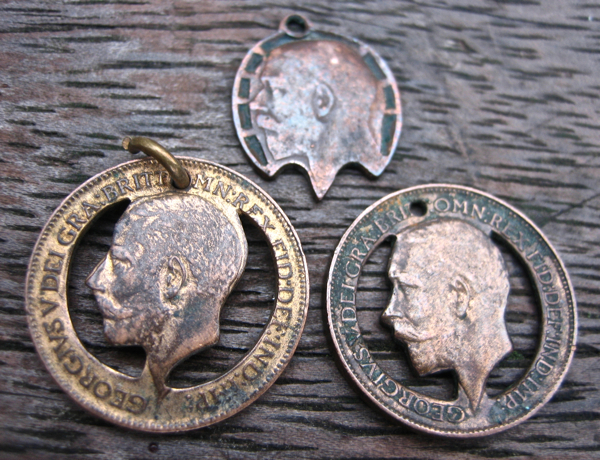 Cut coins from the early twentieth century. the Roman coin from Spitalfields that I wear around my neck. 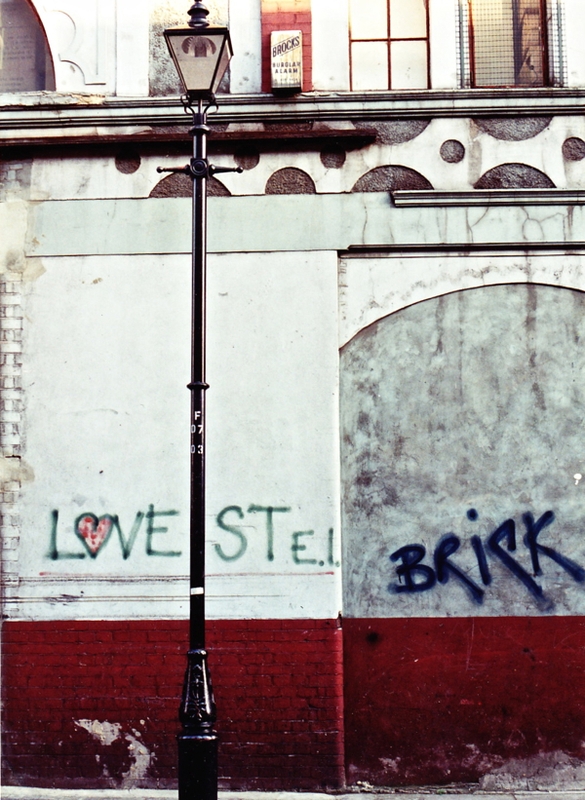 A Spitalfields Valentine from Alan Dein – he took this picture in Fashion St in 1990, but he does not know who wrote the graffiti or why.